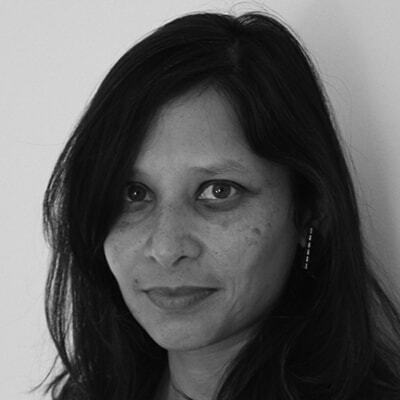 As a licensed architect, Sameena has designed and managed a range of building typologies over the past 15 years. A competent Project Architect, she is focused on pushing the boundaries of design through engagement and problem solving. Her practice and research looks at the intersection of architecture and conflict, and she’s been an artist and curator in residence in Mexico, Decolonizing Architecture in the West Bank, and most recently as a fellow at the YBCA. Formerly an Associate at David Baker Architects, designing and managing affordable housing projects, Sameena is currently studio faculty and the B.Lab Coordinator. She is focused on creating opportunities for student engagement in community-based projects, including making with an emphasis on advocacy. Sameena has an undergraduate degree in Urban Planning from the University of California, San Diego, and a Masters Degree in Architecture from SCIArc in Los Angeles.